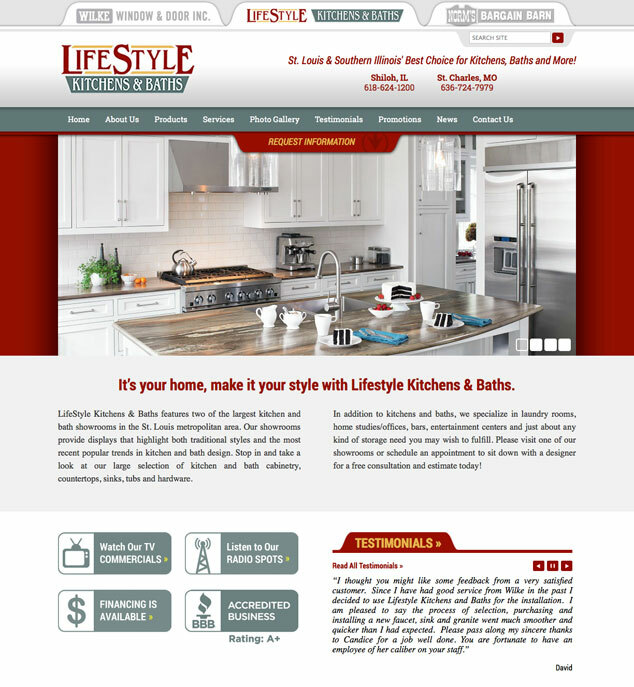 Visual Lure recently launched a new website for Lifestyle Kitchens & Baths, a sister company of Wilke Window & Door. Lifestyle Kitchens & Baths is a full service kitchen and bath supplier of cabinets, countertops, vanities, sinks, fixtures, hardware, accessories and more. They have two locations. One in Shiloh, Illinois and the other in St. Charles, Missouri, both conveniently located next to Wilke Window & Door showrooms. After completing Wilke’s new website, we used the custom designed WordPress theme we developed for them and tailored it for Lifestyle. We changed fonts, the color palette and we uploaded all the new content. By reusing the existing Wilke Window & Door WordPress theme we saved our client a significant amount of time and money, and at the same time it helped create a visual cohesiveness between the two brands. In addition to the design and development of the new site, Visual Lure also performed all on-site search engine optimization (SEO). If you would like to learn more about Visual Lure’s WordPress web design services, please call us today at 618.407-9231 for a FREE web design consultation. 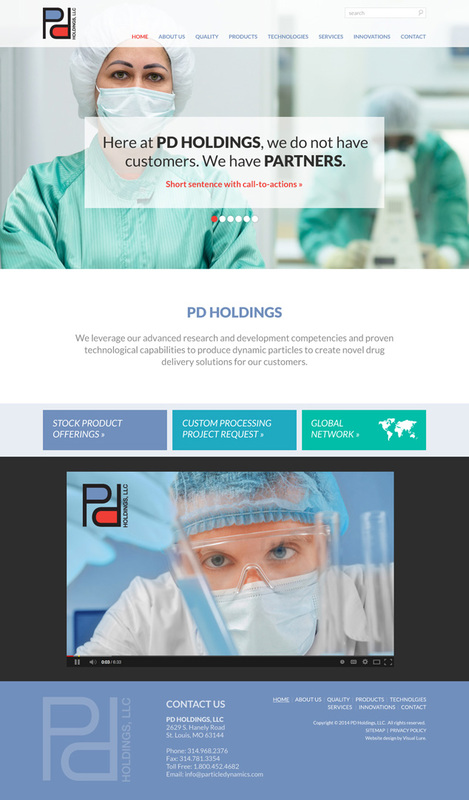 PD Holdings is a global leader in the fields of manufacturing and developing drug delivery solutions for pharmaceutical, OTC, nutritional, and animal & food companies. They are headquartered in St. Louis, MO with an additional facility in Seymour, Indiana. 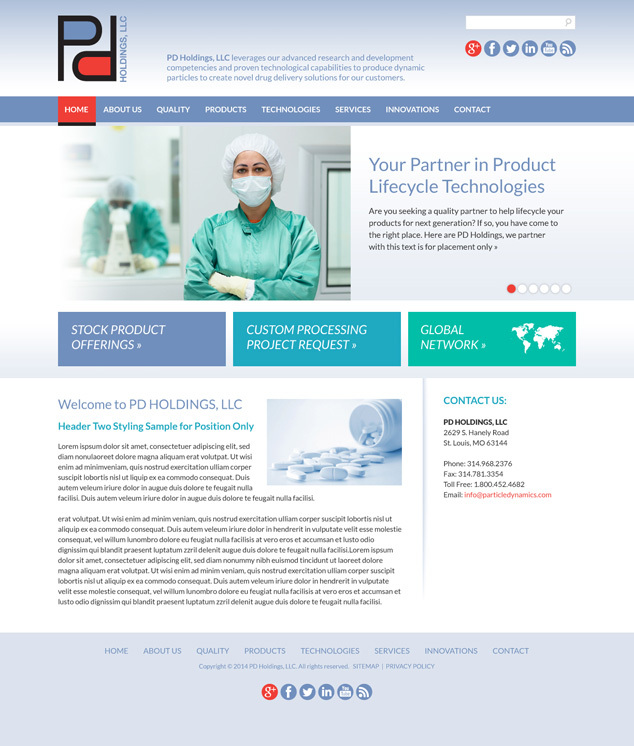 PD Holdings recently contracted Visual Lure to design and develop a new fully custom responsive WordPress website. They requested that the new website be user-friendly and that it look “clean and corporate”. We provided them with two initial home page layouts, one that was more modern and contemporary, and the other which used a more traditional layout. Below is a sneak peek of the initial two home page options along with the template page of the selected design. Visual Lure will also be providing search engine optimization services along with coordinating copywriting, photography and videography services. We are currently in the development stages so check back soon for the official launch of the new website. SwingForeHope.org has officially launched! The new website was suppose to launch before their tournament on June 16th of this year but the company that purchased and controlled their domain name was unresponsive until just yesterday. The lesson here is DO NOT have the web design company working on your website, or anyone else for that matter, purchase or control your domain name! Make sure you purchase it yourself. That way you always have complete control over it. The new website was built in WordPress. It was developed using a custom designed theme. It is fully responsive, making it easy to view and read on any type of device including desktop computers, tablets and smart phones. The site allows users to make donations and pay for the golf tournament and sponsorships. All donations are directly deposited into their PayPal account through the website. Swing Fore Hope is a non-for-profit organization based out of Edwardsville, IL with a vision to help end breast cancer. This non-for-profit has two missions. One, to raise money for breast cancer research, and two, to help support local families facing financial difficulties as a result of this horrible disease. Below are screenshots of the home page design and a sample template page. Please visit SwingForeHope.org to learn more about this great organization. C5T Corporation is a woman and service disabled-veteran owned small business based out of Scott Air Force Base, Illinois. C5T stands for Command & Control, Communications, Computers, and Capabilities Transformation. The majority of their work is government contracted in the fields of information technology and communications with a focus on Department of Defense, military and civil aviation. Most of their staff is made up of U.S. veterans with years of defense department and civil aviation experience as military, civilian, and contractors. C5T wanted the new website to emphasize their patriotism by using red, white and blue and the American flag in the design. The new website was developed in WordPress with a custom designed theme. 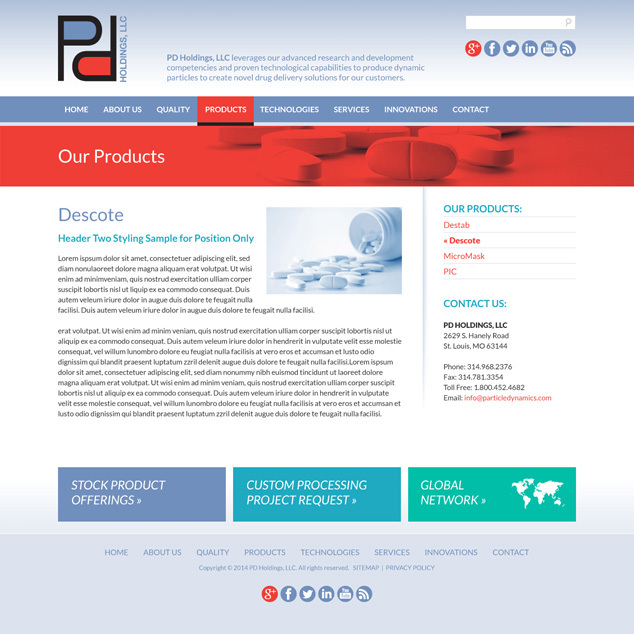 The new theme is responsive, rendering beautifully on desktop computers, tablets and smart phones. It also features an easy to update home page slideshow, multiple easy to maintain widgets including a sub menu widget that automatically populates the sub-page navigation into the sidebar. This makes the site easier to scale as they plan on adding most of the new content themselves. We also updated their logo, staying true to the original, but making it more usable and easier to reproduce. In addition to the website and logo upgrade; we designed C5T a new tri-fold brochure that complements the new site. Visit www.c5t.com to learn more about C5T and click here to learn more about our WordPress design and development services.